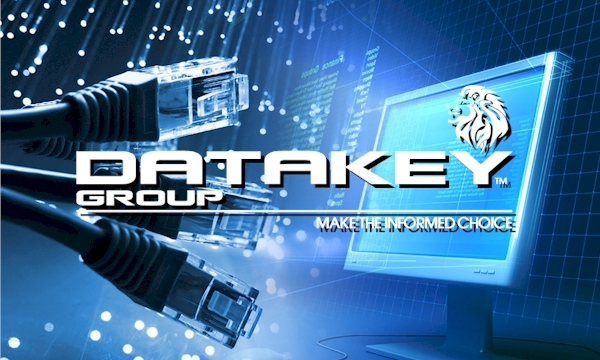 A Quick Overview: A VIP Home for a VIP Tenant" ... 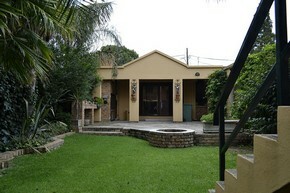 Situated inside the security complex, this house has a ground floor as well as a 2'nd floor entrance. Originally designed for the owner, this unit is a fully fledge house of over 240m2 and comes with high-end fittings and features. Ideal for executives looking for security and privacy, this up-market property is situated in a secure complex and offers a modern living style. 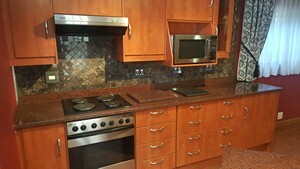 This amazing 3 - bedroom house has 4 - additional appointed rooms!. You get a private garden and entertainment aria and a "lockup-and-go security village feel" without the neighbors. The executive en-suite master bedroom has its own living room / TV room / office, a walk-in closet room and a huge master bedroom. 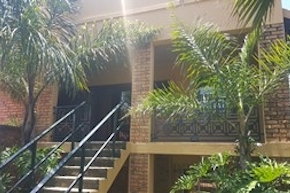 Ample undercover parking space is available, also.. alarm system, security and access control a undercover braai aria, fire pit and outside room for a mini gym or entertainment. The double story house caters for separate living and entertainment arias. The ground floor has an open plan kitchen with pantry room, a dining room and sitting room that offers modern living while the upstairs aria provides privacy and comfort for the occupants. There is also a large laundry room with storage and "smoking room"... Close to shopping centers, schools and access to major highways... An opportunity not to be missed! The ground floor features: An open plan design with kitchen, dining room and sitting room. From the sitting room there is a hidden passage to the guest toilet and laundry room. The sitting room also connects to the "smoking room" , private entrance from the parking aria and the private garden and entertainment arias. The kitchen has ample storage space with under counter cupboards and drawers but it also features a hidden pantry for all your grocery shopping and allows for storage of gas cylinders, plates and items that won't fit in the other storage spaces. The upstairs features:	1 x master guest bedroom (13 m2), 1 x spare bedroom (11 m2), a guest bathroom (6 m2) and the (94m2) master suite with 2 x balconies and private entrance to the garden. 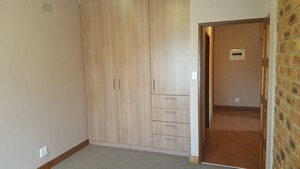 The master guest bedroom and spare bedroom both feature build-in closets, wool carpets and high-end finishes and fittings such as dual wall plugs, 8-panel solid meranti doors, brass door fittings and UV tinted windows. 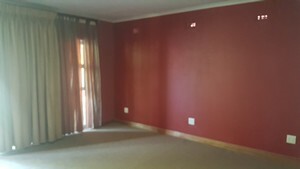 As part of the rental agreement these rooms are also equipped with curtains. The guest bathroom is fully tiled from floor to ceiling. It is equipped with high-end fittings and features a unique mirrored wall. The bathroom consist of a toilet, basin and bath with a hair shower spout. The windows are frosted and provided with curtains. The top landing leads to the private master suite consist of 4 arias; the master bedroom with ensuite, sitting room / TV room or study room, a large walk-in closet room and a large private bathroom. The master suite consists of: A spacious(18.5 m2), bedroom that is connected to a en-suite (8.6 m2) walk in closet fitted with hand crafted meranti "one-of-a-kind" shelving, hanging compartments and ample storage space. 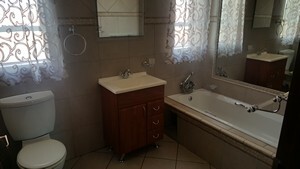 Adjoining the master bedroom is the (11 m2),en-suite bathroom. The bathroom has a large walk-in shower, oval raised spa bath to you have a view over the garden, a his / hers ceramic wash basins on a handcrafted one-of a kind cabinet with drawers and marble top. A portioned toilet provides privacy and full length dress mirror and overhead wall mirror is also provided. The wall tiles are a combination of imported porcelain tiles, cream granite and a mixture of natural stone and tile. Quality Italian taps and fittings were used to finish of this amazing bathroom. 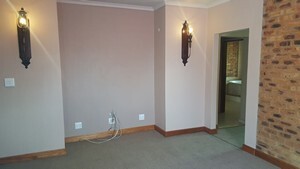 Lastly the master bedroom has its own ensuite, sitting room / TV room or study room. 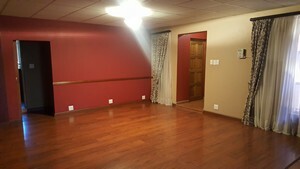 This room provides the occupant with an private upstairs option to work or relax. It is totally separate from the rest of the house and also provides access to the master bedroom, for kids without actually walking directly into the master bedroom, walk-in closet room or bathroom. The room also has its own sliding door and mini balcony. The master bedroom has a (6 m) wide sliding door that opening unto your own (14 m2), private balcony overlooking and providing private access to the outside. The balcony has a staircase that leads to the private garden and entertainment aria. Situated at the top of the garden is a patio, water feature, fire pit, undercover build in braai and a outbuilding that can be used as storage space, a mini gym or as a entertainment seating aria. The undercover braai is a top-end Fire-master braai with one-of-a-kind rotisserie fitting. There is a hidden garbage bin enclosure, storage aria for wood and braai tools. The waterfall and pond water feature is an attractive and relaxing place to sit and read a book or to entertain your guests. In addition, green “mood lights” were installed in the garden for evening entertainment. The garden is planted with evergreen plants, palms and shrubs, it is low maintenance and the rent includes a weekly garden service. 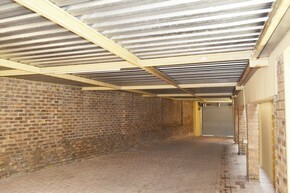 The garage is a large undercover parking that can accommodate either 3 large cars and 2 trailers or 4 medium cars. The entrance to the parking aria is secured with an automated garage door. Unit F has it's own private access controlled gates and comes equipped with intercom access	control, alarm system. All light fittings are power savers and the unit has its own "Unipin" pre-paid electrical and water meters. To apply for this unit, click on the "Apply Now button below and fill out our "Contact Us Form"... we will be in touch very soon! 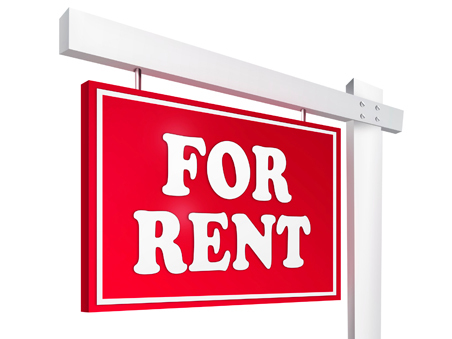 ** Kindly Note: No Agents need enquire, No large pets are allowed on the premises, and occupation is limited to 3 family members as no sub-letting or commune rentals will be considered. Open plan kitchen, dining room and kitchen, walk trough to wash room, guest toilet, smoke room, private garden with entertainment aria, gym and garage. Harwood floors, tiles, meranti doors, brass fittings, granite tops, a walk-n pantry, yellowwood island with granite top... and much more is available in this home. 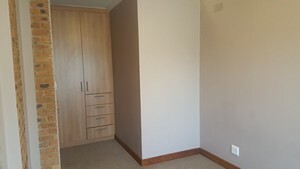 A large spare room that can accommodate a double and single bed. 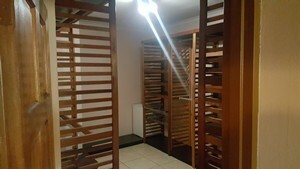 The room has a large build in closet space with drawers and beautiful finishes throughout. A large bedroom for your VIP guests, can accommodate a king size bed, has a large build in closet with drawers. A beautiful bathroom, toilet, basin and bath with a unique mirrored wall. High end finishes troughout, fully tiled from floor to ceiling. This house boasts a private ensuite TV room that can also serve as a study or small office. Completely private from the rest of the house. A huge bedroom fit for a king that will also fit a king size bed! The master bedroom has a private balcony that walk out onto the private garden. Ensuite is your walk in closet room, bathroom and private TV room. Every woman's dream, a large walk-in closet room with ample storage, hanging and shelve space. Once you have experienced this luxury you will never want to go back to a normal closet! Luxury is the term most often used when guest see this amazing bathroom. 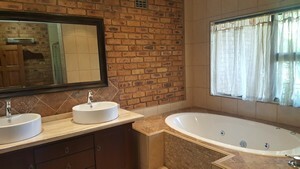 Tiled from floor to ceiling with a his end hers basin, raised spa bath, walk in shower and partitioned toilet. High-en Italian fittings, a place to relax! A 6m wide sliding door opens your Master Bedroom to the outside private balcony that also looks out onto the private garden. Relax outside with a cup or a glass of wine and a book and enjoy the morning sun! The private garden is an evergreen peace of paradise, with braai pit, built in mega master braai with rotisserie, entertainment aria, mini gym facility and your very own wall fountain and pond! Something for the man of the house, a very large garage that can accommodate up to three vehicles. Private entrance from the front of the business park, and plenty of side storage space for those odds and ends!